The Nassim is located at No. 30, Street 11, Thao Dien Ward, District 2, Ho Chi Minh City, Vietnam. Thao Dien, is fast becoming Ho Chi Minh City’s most desirable location, with its tree lined streets and plenty of green space, all within minutes of District 1 by the Hanoi Highway and new Metro Line. Locating within reach from the most reputed schools, healthcare providers and sprawling malls, The Nassim offers its residents amazing convenience. Residents are also able to enjoy comfort with a mere 15-min drive to the Central Business District and well-connected to other districts via the main roads. 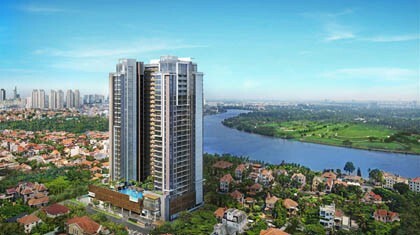 Undoubtedly, a complete world offering a well-rounded lifestyle is at resident’s hands. A 25m Lap Pool surrounded by Terrace’s Aqua Deck, a Jacuzzi hideaway and poolside Pavilion for more private relaxation, an Aqua fountain-designed floating walkway – all form landscape to provide perfect 360-degree picturesque view. With a fully equipped gym fitted with state-of-the-art equipment, yoga rooms and sauna rooms to reboot and replenish for the day. For kids, the vast, outdoor playground and the Kid’s Pool are always open to encourage a steady stream of activities.